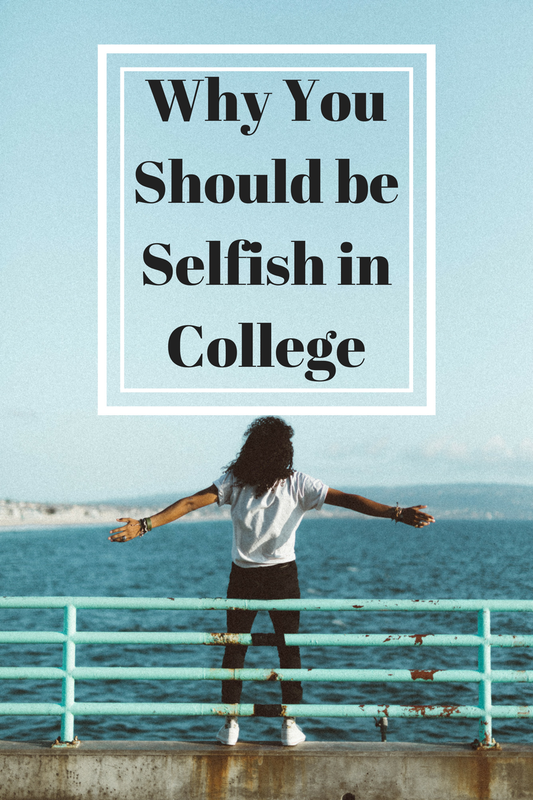 College can be a strange time in your life - it feels like you're still a kid, but you're also expected to take on adult responsibilities, while at the same time not treated like a full-fledged adult. Tricky, right? There's so many expectations in college, too. You're supposed to decide what to do with your life, or at least in the foreseeable future, and get your life together when it feels like you haven't even started it yet. When the whole world is telling you GROW UP, it's completely fine to be selfish and focus on yourself, and it's probably what you should do. How else are you going to decide what to do with your future? At the end of the day it's your future, and you get to decide what to do with it. College is the time where you probably only have to be responsible for yourself, so it's the perfect time to get to know yourself and realize what you want in life. Your late teens and early twenties can be really confusing, so it's natural to take a step back and tell the world to shove it, and do what you want. Of course, the people who love you are going to want to help you out in any way they can and want what's best for you, but it's still okay to do what makes you happiest. Your twenties especially are the perfect time to start and figure your life out - although you can do that at any time - which fits perfectly with college. It's overwhelming to choose a major that will possibly affect your entire life, so it's probably in your best interest to focus on yourself. Be selfish and do exactly what makes you happy; take solo travel trips, eat what you want, do yoga - spend your time how you want to. Whatever you feel is going to help you figure out your life and what you want is what's best. It won't be the same for every person, so don't focus on what everyone else is doing. Take classes that interest you in college, even if people say it won't help you in the future. It's also completely fine to take classes outside of your major if you've already decided on one. Maybe they won't be applicable to your future career, but you'll be learning something new about a topic that interests you, and that's still helpful to your life. It's just as important to foster our curiosity and spark creativity outside of what you're used to. Some of my favorite classes have been outside of my majors and minors in college. The truth is, none of us know completely what we're doing. Even the most seemingly put together people can have no idea what they're going to do in the future. That's okay. Focus on what you're doing now, and keep your options open for the future. Life is more fun when you aren't following a concrete plan of what you want to do, and oftentimes those plans don't pan out exactly how you would like them to. Do what you want in college, and focus on what makes you happy. Be selfish and say no to people if you don't want to do something, or say yes even if it terrifies you. Be adventurous, or don't - it's all up to you, and you don't have to justify yourself to anyone.